The South Main Historic District is one of Middletown, Ohio’s oldest Historic Districts. Contained within it’s boundaries are eighty-one structures that have been placed on the National Register of Historic Places. Although this district contains a variety of architectural styles, building materials, setbacks, landscaping and land uses, there is still a sense of continuity that runs throughout our neighborhood. When looking thru old 1800-Early 1900’s newspapers you’ll find articles of tea parties, social gatherings, weddings and all sorts of other community events. The South Main Neighborhood Association or PRISM ( Preservation – Restoration – and Improvement of South Main ) as we are less commonly known has been working since the 1970’s as a group in order to preserve and maintain our chunk of historic Middletown. Today these traditions still live on. We keep up the tradition of meeting monthly and gossiping about whats going on around town, we get to see our friends and neighbors and share in community. Throughout the year we host several neighborhood picnics, pools parties, Christmas dinners, new neighbor cocktail parties and neighbor cleanup efforts. 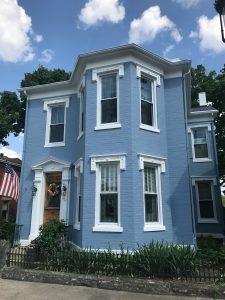 Please make sure to walk our streets and experience the pleasure of seeing so many Victorian Era homes that still exist, homes that have many many active restoration efforts in the works. South Main is a transitioning neighborhood that has gained great momentum. Everyday trucks and ladders are up working on restoring what was and is one of the best neighborhoods in Middletown. Copyright © 2017 South Main Historic Neighborhood Association, Inc.